In contrast to the fragmented remnants of the British settlement in the west and centre of Singapore, Chinatown, on the south side of the river, remains contained and complete within the boundaries marked out in Stamford Raffles town plan of 1822. Little of the high-rise development that marks so much of modern Singapore has invaded to disrupt Chinatown’s continuity. It lurks at the edges, nonetheless, a ring of stark, concrete and glass towers, dwarfing the two storeyed shop houses, accentuating the narrow streets and throwing their bright colours and constant movement into sharp relief. .
Chinatown’s history is one of hardship and struggle. The original settlers were mostly men who had fled bleak times in their homelands to seek their fortunes in the flourishing new British port. Most came from the provinces of China, some were Peranakan, or Straits Chinese from Southern Malaya and others Indian. All settled in their own enclaves within the Canton. During the gruelling early years, the men were pressed into virtual slavery as coolies in the go-downs, or warehouses, on the riverside docks. Soon hawkers, traders and tradesmen arrived to service the needs of the new community; letter writers, who provided the only means of communication between the mostly illiterate workers and their families at home, tailors, clog-makers and rickshaw runners. In time businesses were established; medicine shops to minister to exhausted and often opium addicted labourers, gold and jewellery shops, where the workers, always distrustful of banks, could invest their money and Bak Kwa shops, selling traditional barbequed meat. Few women settlers arrived before 1870 but eventually, wives followed long-lost husbands and soon whole families migrated. Skilled, disciplined and beautiful as Japanese Geisha, Pipa Girls, so named because of the stringed instrument they played, arrived to entertain in the leisure clubs. 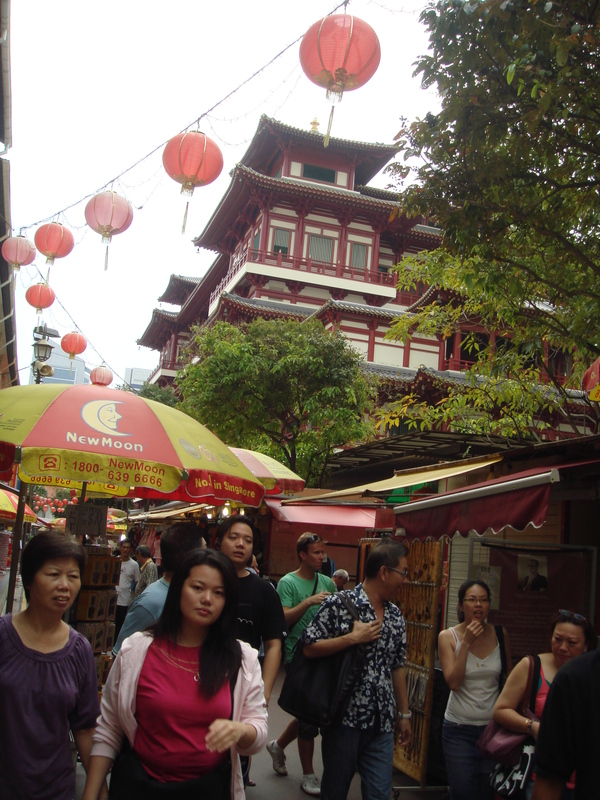 Places of worship were built; the Buddha Tooth Relic Temple, the Sri Mariamman Hindu Temple and the Jamae Chulia Mosque. By the beginning of the 19th Chinatown was a thriving community with a strong spirit. It was this fiercely loyal, battling community spirit that sustained it through the dark days of the Japanese occupation and enabled it to re-build. .
Chinatown is still a strong community and a thriving one. Old traditions still survive. Old festivals and rituals are still observed. The Temples and the Mosque still fill with the faithful. Offerings of incense, moon cakes and oranges still lie before its shrines . Old men still play checkers in Kreta Ayer Square outside the Buddha Tooth Temple. Although the Pipa girls have gone, along with the letter writers and the clog-makers, the flourishing Chinatown Crafts Centre keeps ancient skills and handicrafts alive. The rickshaws have become tri-shaws, no longer pulled but peddled and by men in baseball caps rather than coolie hats. Although many old businesses have vanished, some remain. Eu Yan Sang’s Traditional Chinese Medicine shop is one of them. Founded in 1879 by Eu Kong, the business now sells thousands of different products and has outlets all over Asia. On Cheong Jewellery, one of Chinatown’s original gold merchants is another. Lim Ghee Guan and Bee Cheng Hiang have been selling Bak Kwa for almost a century. Alongside these enterprises from a past age, in the narrow streets of last century, in the old shop houses, lit now with fluorescent and neon, new businesses flourish. There are state of the art electronics shops. Antique galleries sell beautiful things from all over Asia as well as distinctive Peranakan treasures; furniture, ornaments, china, household linen and jewellery. There are emporiums filled with gorgeous modern Chinoiserie; bags, boxes, fans, tunics, robes, Cheong Sams of every colour, cut and design, beautiful Peranakan Nyonya Kebaya and Sarong Kebaya and accessories to go with them. Tailors offer packages and specials, made to measure in 8 hours and delivered to any hotel or corner of the world. Restaurants serve cuisine from every region of China, along with Indian, Malaysian, Thai, famous local dishes, like Singapore noodles, naturally, and believe it or not, there’s even a German sausage stall, Eric’s Wuerstelstand! Today, business booms, both day and night in Chinatown.